We work at the interface between engineering and neuroscience. Our aim is to understand how information is represented and processed by mammalian neural circuits underlying perception, action and memory. Understanding how “cortical circuits” process information may help us to understand how it it dysfunctions in neurodegenerative disorders such as Alzheimer’s Disease, and also aids in the design of novel computational devices. Our work involves both neuroscience experiments and theoretical/computational work. We use a number of technologies to probe cortical circuit function - two photon calcium imaging, holographic optogenetic perturbation of genetically targeted brain cells, and electrophysiology. We also develop novel algorithms, based particularly on information theory, for analysing high-dimensional neuroscience datasets. 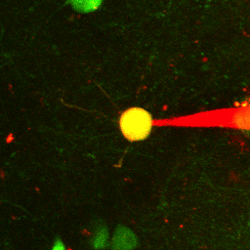 At left, a neocortical GAD-67 interneuron patched using RITA, the Two-Photon Targeted Robotic Patch-Clamp Electrophysiology system recently developed in the lab (Annecchino et al, Neuron 2017). 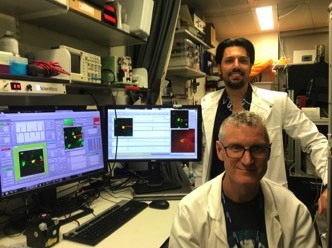 Prof Schultz (lower) and Dr Annecchino using the RITA software (shown on screens at left) to control the two photon microscope and electrophysiology rig. Top Banner: Layer 6 cortical pyramidal cells labelled with a retrograde, monosynaptic rabies virus carrying GFP, injected in the lateral geniculate nucleus. Imaged using serial two-photon tomography (TissueCyte 1000). Copyright G Moore, S Schultz, S Brickley, 2017.